Nestled in the Nurata mountains ridge lies Hayat village, a perfect spot to spend a few days with an Uzbek family and enjoy the beautiful, natural landscape and traditional life of this region. There are no hotels, so the development of eco-tourism is a welcome opportunity for travellers to explore this area. In conjunction with Uzbek Tourism, the German development agency DVV International, ran a series of training programs with villagers. These courses covered guest house management, eco-tourism, hygiene and sanitation, meal preparation etc to meet the needs of foreign visitors. Importantly the home stay is able to issue registration slips for your stay. This is a requirement for all tourists to Uzbekistan. I stayed with Narzullo and his family during Novruz, the spring New Year festival. The guest house is simple and comfortable. Built from local materials, there are seven cosy rooms. Guests share bathrooms - solar panels provide hot water. Like all 650 inhabitants of Hayat, Narzullo's family has lived there for generations. They produce almost all their own food. Breakfasts included delicious homemade yoghurt and cheese, garden fruits, jams and local eggs. Adjacent to the guest house is a nature reserve, where Narzullo's father worked in the Soviet era. The reserve is home to the endangered Severtsov wild sheep as well as wild boars, foxes, wolves, porcupines and badgers. Plenty of stone grouse inhabit the reserve; golden and dwarf eagles and the bearded vulture also live there. There is no internet, no cell phone coverage. Instead, relax in the garden under the shade of almond, apricot, mulberry and walnut trees. Or, accompanied by a family member, hike up the village slopes or along the river banks and ancient agricultural canals that crisscross the countryside. Ancient petroglyphs can be seen on the rocky slopes and in spring the display of tulips is dazzling. Guests are more than welcome to help make Uzbek bread in the tandyr oven or participate in the preparation of the national dish - plov. Narzullo can also arrange excursions a little further afield, such as a visit to the Nuratau-Kyzylkum Biospheric Reserve. Within this beautiful reserve is a vast and holy 1500-year old Madzherum archa (biota orientalis) tree. The tree's circumference is 24 metres. Some people believe that the tree was planted by Alexander the Great on the grave of one of his military chiefs. (Nurata was founded as the ancient town Nur, in 327 BC, by Alexander the Great). 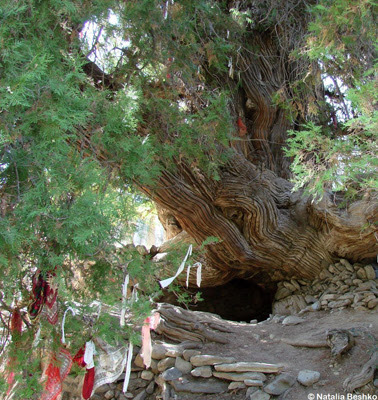 According to local legends, the tree is endowed with miraculous powers, - pilgrims visit and tie a fabric scrap on a branch as they request God to fulfill their wishes. At least 5 people can fit in the tree's hollow - locals claim that there was once a school there. The ruins of a mosque are adjacent. A brook near the tree is a delightful spot to have a picnic lunch. Nearby are the the Aydarkul and Tuzkan lakes, the Kyzylkum desert, Farish steppe and the highest point - Hayatbashi - at 2198 metres. Again, Narzullo can arrange visits to these places. With Narzullo I visited a farm and picked wild mushrooms that were included in the meal that evening. 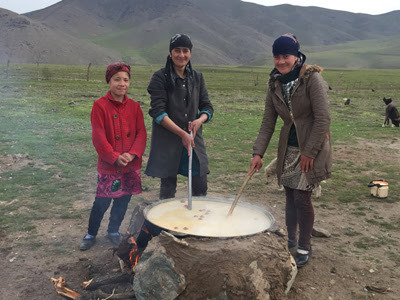 I was there at Nowruz, spring New Year, and, while hiking, a family invited me to help them stir the sumalak - the traditional, sweet paste made entirely from germinated wheat. A Novruz festival was held an easy 4-kilometre walk from Narzullo's home. People from all the surrounding villages streamed along the valley paths to enjoy musical contests, buzkashi (Central Asian polo), and picnics.